Comments: A large, white-headed gull with pink legs, breeding adults have black wingtips with white “windows” on their first two primaries and a yellow bill with red spots underneath. Immature plumages are difficult to distinguish from those of other immature and wintering species. 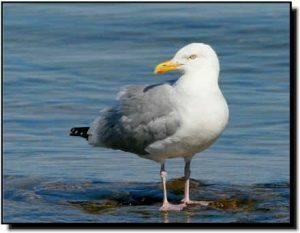 The light colored iris, pink legs and lack of black on the bill will distinguish Herring Gulls from California Gulls in breeding plumage. Pink legs and lighter colored mantles contrast with the bright yellow legs and dark mantles of breeding Lesser Black-blacked Gulls. Herring Gulls also hybridize with Lesser Black-backed, Glaucous and Glaucous-winged gulls. Herring Gulls are opportunistic feeders but feed primarily on fish and invertebrates. Within the Great Plains, they nest primarily on the northern and eastern edges and winter in the central and southern parts.